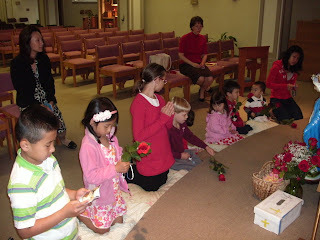 The eighth year anniversary of the first meeting of the Children’s Rosary is on April 10th 2019. We have made it an annual tradition to offer a novena of Masses for the 9 days prior to the anniversary for the fulfillment of Our Lady’s plans for the Children’s Rosary. We then follow this with 9 days of Masses in thanksgiving. The novena begins tomorrow. Bishop Fuentes of Minas, Uruguay will be offering one of the Masses on April 1st for the Fulfillment of Our Lady’s plans for the Children’s Rosary. If there is a particular date you would like to sponsor, please let me know. If you would like to request a Mass be said at your Parish or another location this is wonderful as well.